Thomas Martin was a wheelwright by trade. He married Margery Mendenhall when he was 24 and she was 19. The modest 2 pounds Margery inherited upon her father's death in 1682 indicate that her father provided her a dowry when she married. "ANNO 1682 On the 1st day of the month called April, Thomas Martin of Great Bedwyn was taken by the tithingman of that parish and carried before Justice Hungerford, who sent him to prison. At the next sessions, he was indicted for three weeks absence from national worship and refusing to give bail to traverse the indictment, was recommited to prison." The late 1600's were not a happy time for English Quakers. William Penn returned to England and worked to free over a thousand Quakers from English and Welsh prisons. James II, a Catholic, was crowned king in April of 1685. The decision to make the 2 month journey to America could not have been an easy one. Sailing ships of that time lacked sanitation and gave way to many diseases, including smallpox. (For instance, thirty-one of the one hundred passengers who crossed the Atlantic with William Penn aboard the Welcome in 1682 died of smallpox.) Thomas and Margery made the courageous decision to immigrate in defense of their religious freedom. Thomas, Margery, and their children Mary, Sarah, Hannah, Rachel, and Moses arrived in America on the 16th day of the 10th month 1685 (December 16 on the Julian calendar). They traveled aboard the ship named the Unicorne which left from Bristol and landed in Philadelphia. They were accompanied by Margery's brother Moses, who had originally left England for America in 1683, and returned to England in 1685. Moses eventually returned to England, where he married and remained for the rest of his life. The Martin family settled in Concord and attended the Concord Monthly Meeting. Thomas Martin soon became a landowner in Concord. On November 27, 1686, he bought 100 acres from his brother-in-law, John Mendenhall. On March 4, 1689, Thomas bought 200 acres on the east bank of Chester Creek in Middletown Township from Thomas Cross. The northern boundary of the property was a stream which flowed into Chester Creek. The stream was first known as Martin's Run; the name was subsequently changed to Rocky Run. In 1709, Thomas Martin bought 90 acres of "oversurplus" land. This property joined up with his existing homestead to the north, on the opposite side of Martin's Run/Rocky Run. The Martins did not remain Quakers. According to Early Church Records of Delaware County, Volume 2, pg. 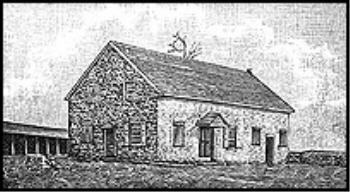 286, Brandywine Baptist Church Records, Margery Martin was baptised 27th day, 7th month 1697 in Ridley. Thomas Martin was chosen to administer baptism to those in need and was himself baptised on 28th day, 4th month 1697. Thomas died in 1714 at the age of 64. Margery died in 1742 at the age of 87.